In order to best see how our palletizing systems function and what benefits our customers derive from them, please examine some examples of installed application systems. We have selected 5 examples that are typical for applications involving cartons, paper bags and PE bags. Unilever is one of the world’s largest suppliers of laundry and cleaning agents, as well as name brand articles in the foodstuff, skin care, perfume and cosmetics industries. 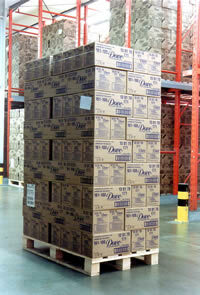 Our application example shows Unilever Dove soap packed into cartons and loaded onto pallets. 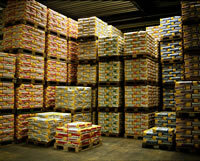 Unilever protects these pallets against slippage by applying GRIP FIX™ from H. Rand GmbH. 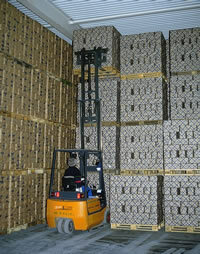 When fully loaded, each pallet holds 117 cartons and weighs 660kg. 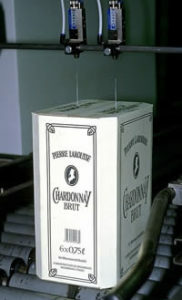 The uppermost layer of cartons is additionally secured by a tension strap. Based on a production of 32,000 metric tons of soap per year (exported to 86 countries), approximately 14 metric tons of stretch film can be dispensed with, representing 14 fewer tons of waste per year. The French wine producer, Caves de Wissembourg, relies on H. Rand GmbH´s palletizing safety systems to safeguard their valuable and easily damaged goods during transport. Approximately 50,000 pallets of wine and sparkling wine are shipped each year, with each pallet bearing 84 cartons that have received an application of GRIP FIX™ anti-slip agent, as well as a stabilization strap around the uppermost layer. This method saves in the area of 9 metric tons of stretch film and waste per year. The Borealis Group primarily produces polyethylene and polypropylene granulate for various applications, such as those used in the automobile, packaging and electronic manufacturing industries. The company is headquartered in Copenhagen, Denmark. In Belgium, Borealis produces around 240,000 metric tons per year. Shift-free transport of the PE bags is ensured by GRIP FIX™, and also a supplemental stretch cover. Fifty-five bags, each weighing 25kg, are transported per pallet. Use of the palletizing safety system from H. Rand GmbH enhances pallet stability and enables the reduction of the stretch cover thickness. Kiesel Bauchemie produces adhesives for floor tiling and coverings. Their products are filled into paper bags, 42 bags per pallet. The company produces 40,000 metric tons per year and exports to 5 countries. GRIP FIX™ from H. Rand GmbH is applied for pallet stability. A unique warehousing feature of the Kiesel company is that 5 pallets are stacked one above the other. Therefore, the stability of each individual pallet plays an even greater role. Utilization of the GRIP FIX™ palletizing safety system maintains internal pallet stability and reduces the cost of and need for 10 tons of stretch film. 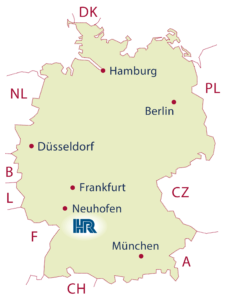 Today, with more than 50 sugar factories, Südzucker is the largest sugar producer in Europe. Around 30,000 metric tons of sugar are produced annually at the pictured location. In order to guarantee secure transport, Südzucker depends on the GRIP FIX™ products of H. Rand GmbH. In our application example, each paper-wrapped bundle contains 10 x 1kg packages of sugar. In turn, each layer contains 12-14 bundles, and each pallet is loaded with 8 such layers. Each loaded pallet weighs 1,000kg. GRIP FIX™ is only applied to the three uppermost layers of the pallet. The result is reduced transport damage and increased protection against shifting in the distribution system.